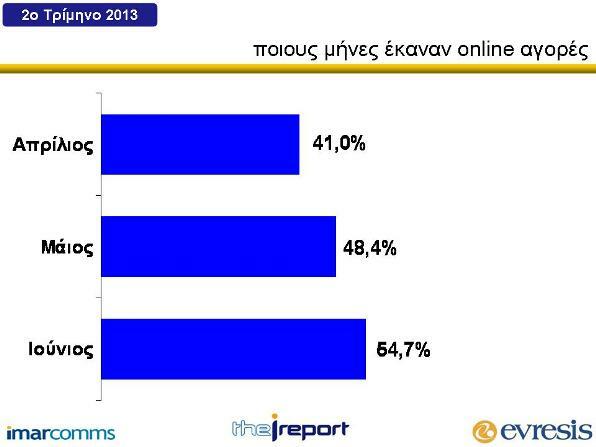 The results of the second quarter of 2013 of the subscription tool for measuring and analyzing online shopping in Cyprus - the I Report - were announced today by Evresis Research and Interactive Marketing Services Company, ImarComms. 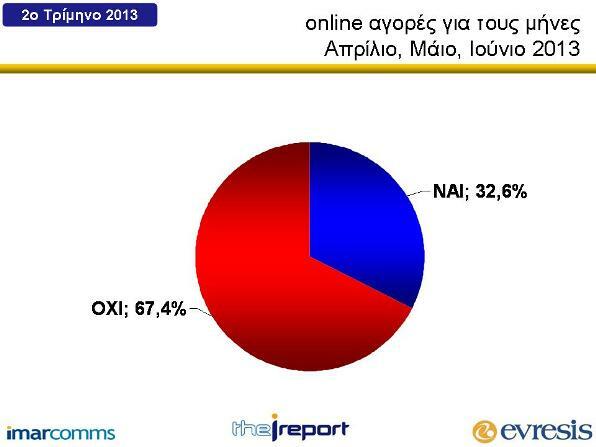 The I Report tracked the online behavior of the Cypriot consumer for the second quarter of 2013 with June recording the highest buying traffic of the quarter with 54.7%, but being afar from the record held by the past June 2012 with 66.1%. In a similar pattern moved the remaining months with I Report recording as second month in online shopping May with 48.4% and as third April with 41%. Although there is a significant decrease from the same quarter last year this quarter shows signs of recovery after the general decline from the first quarter of 2013 due to Eurogroup decisions. Overall, online purchases recorded an increase of 1.3% from the previous quarter of 2013, reaching 32.6% with evidence that this rise will also continue in the next quarter reaching the levels before March 15th. Compared to the respective quarter of 2012 a decrease of 2.3% was recorded. The I Report also recorded a significant increase in online purchases that were made from the Office with 59% compared to the previous quarter. Alongside, it was recorded an increase in purchases that were made from Tablets with 7%. In addition, 91.7% of online purchases were made from home and 16.9% from mobile phones. "The results of the second quarter of 2013 mark June as the month of substantial recovery of online shopping and the return to the upward trend that was recorded in the past with signs that it’s going to continue in the next quarter as well," said Nicholas Nicholaou, Director of Evresis. As first the “Clothing Category” with 42.1%, with a marginal increase from the previous quarter, with sportswear reaching 51.7% and work clothing reaching 63.9%. As second the “Category Travel Packages” with 19.8% and 13.2% increase. As third the “Category Flight Tickets” with 16.3% and an increase of 2.8%. The “Category Mobile Phones” stabilized at 15.1% holding the fourth place. Regarding websites and online shops from where the purchases were made, the I Report recorded as first Ebay which rocketed to 58.2% with an increase of 11.1%, as second followed Amazon with 26.4% recording a decrease of 0.3%, and as third Asos with 19.5 % and a 1.8% increase. As fourth follows Cyprus Airways which climbed for the first time at 9.3%, and as fifth Pame Diakopes with 6.2%. 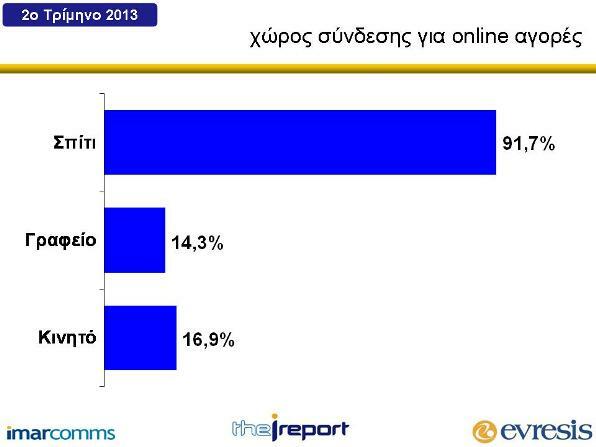 Also from other online shops, the I Report recorded among the Top Ten amongst others - Aegean with 5.9%, Net-A-Porter with 5.8%, Strawberry Net with 5.2% and River Island with 4.0%. When asked what is the main reason that they shop online, 7 out of 10 answered that "it is cheaper." "The second quarter of 2013 showed a recovery of online shopping, and with the exception of online travel shops most traffic was recorded on foreign e-shops demonstrating the need for domestic online shopping options for confronting the international competition and the leak of local funds and loyal customers, "said Pericles Ellinas CEO of ImarComms.